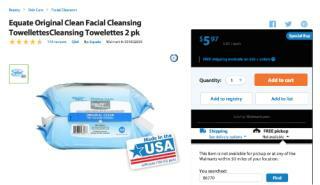 The company's store brand Equate Beauty Wedge Applicator Sponges, formerly labeled "Made in the USA" on the website, "are made in China according to the product packaging," the letter says. Some "USA" labels conflict with the product information on the same Web page, according to the letter—including Equate 7 Day Dental Whitening System Advanced Whitening Wraps (imported) and Almay Intense I-color Liquid Eye Liner (made in Germany). Some USA labels ignore the fact that the product is only partly made, or is assembled rather than made, in the US, the letter adds. I have often told my family that if someone would start a department store just the same way that Walmart was started, they would put Walmart out of business. Walmart started out in every new city, by promoting "service". They had a representative in virtually every aisle, and you never had to go far to ask a question or get assistance. Their checkout lines were fully engaged and short lines with no waiting was the norm. Aisles were clean and uncluttered, with lots of open space. Then once established, with Kmart and other small business competitors out of the way, all of a sudden the service was gone, you now have to go to the service center and ask for someone to meet you in Sporting Goods, etc., and forget about getting an answer to a question (even the people that work in the specific department have no clue). Few checkout lines are open, even the self-serve lines are packed (as people believe they will get through there faster than waiting in the regular line). Aisles are packed with supplies for restocking, making navigating through the store an exercise in frustration. In other words: Walmart is the DEVIL!!! If you want a nice air conditioned activity for a day, walk through a Walmart and look for something that says "Made in the U.S.A." on the product label. Take a lunch.